And the money raised goes to ……. 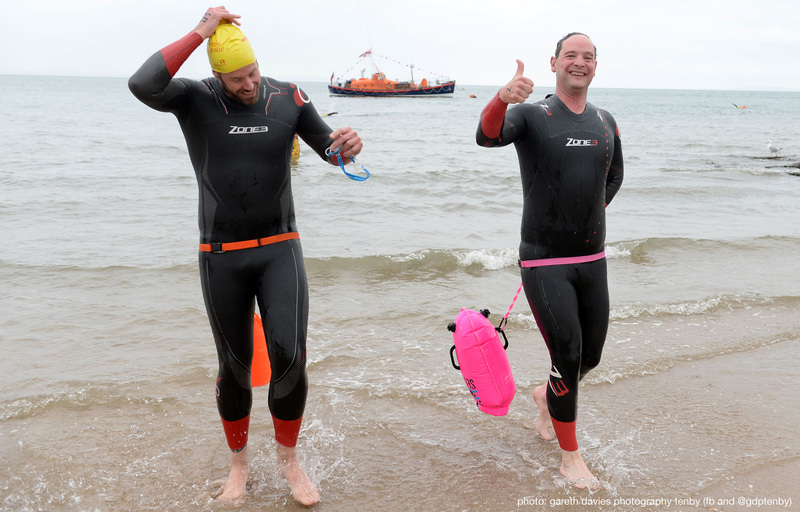 After the challenges of running the Caldey Swim this year, over £3,000 has been raised for our two beneficiaries. 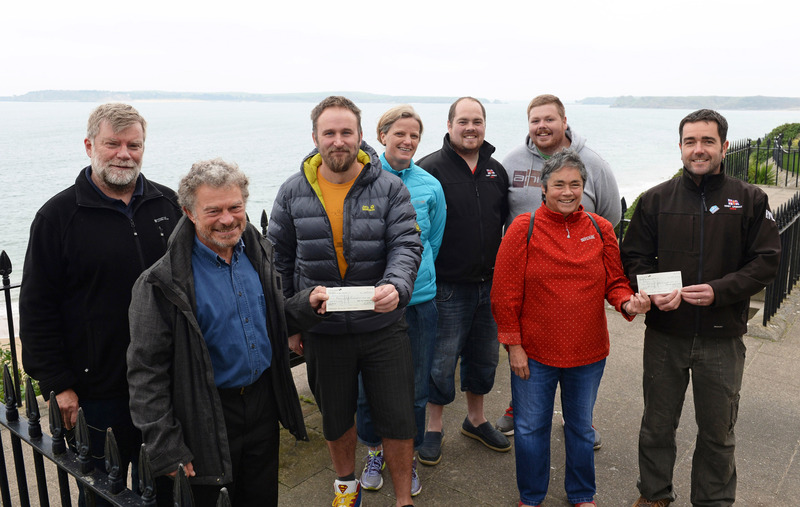 Representatives from both Tenby Lifeboat and Tenby Surflink are pictured receiving cheques of £1,500 from the organisers, Tenby Sea Swimming Association, last Sunday. 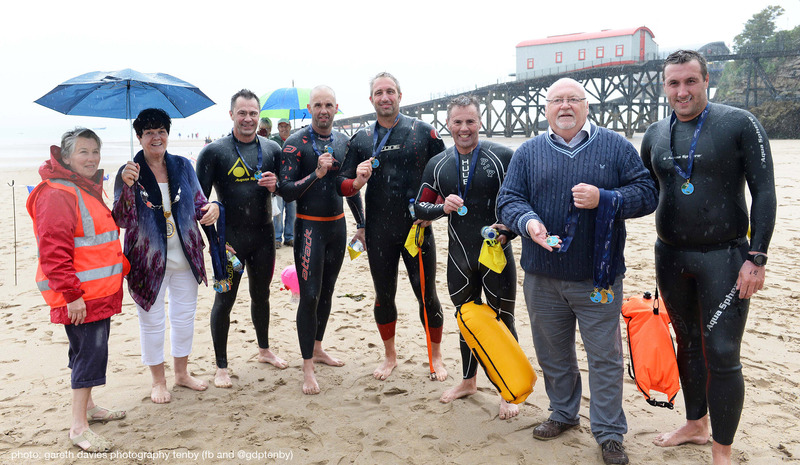 After the disappointent of the initial swim on 6th August being postponed, it was with some relief that the swim took place on 20th August. Disappointment, too, for the 31 swimmers who couldn’t make the backup date, but this was a little offset by the 15 new swimmers who ‘swam into the breach’. Conditions were more challenging than the ‘mill pond’ of last year, but thankfully only one swimmer had to be pulled from the water. And the lifeboats past & present cavalcade was a mood enhancing backdrop to the event. Some photos for you below and here is a little video, taken by one of the kayakers, which is also mood reflective. 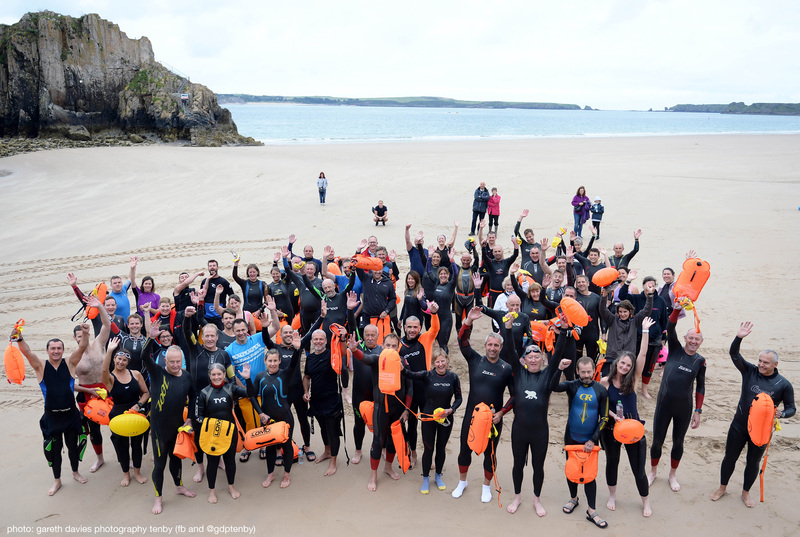 So, thanks to the sponsors, the safety crews, the RNLI, Coastguard and Tenby Surflink and Sailing Club personnel and all the organising committee for another Caldey Swim completed. Caldey Swim 2017 is on! After the disappointment of two weeks ago, when the swim had to be postponed because of high gusting winds, today’s ‘ second bite of the cherry’ succeeds. The swim is on! For swimmers a relief that they can now use that adrenalin for a purpose. And if you’re around Tenby today, between 11.30 and 2pm, why not come over to the South Beach, Castle Hill or the finish between the harbour pier and the old lifeboat house to lend your support. This event is no mean achievement, so the best of luck to the swimmers! This Sunday, 20th August, starting from Caldey Island at 11am, we try again! Hoping for better weather conditions than the original date. The Caldey Island ferry boats with swimmers on board will leave Tenby’s Castle Beach at 10am. The swimmers are due in by 1pm. 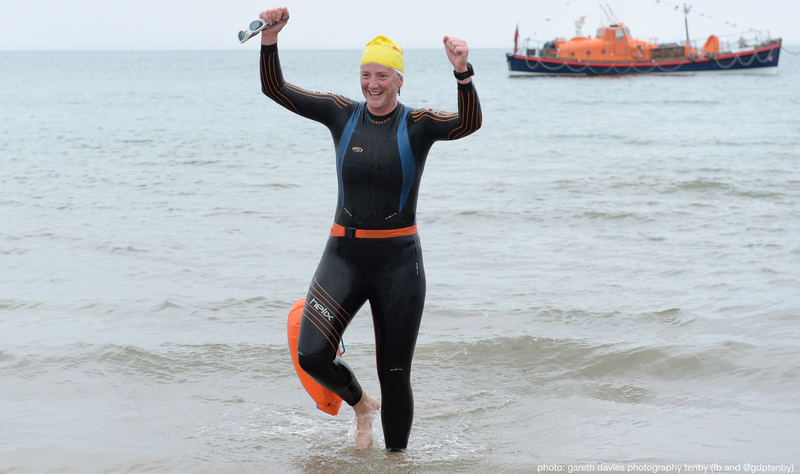 Finish line, with flags, bananas, spring water and medals – for the swimmers – will be between the harbour pier & old lifeboat house, at the southern end of North Beach. If you’re not swimming, why not come to see them home – first swimmer due in about 11.40. Apologies to all, but we have had to postpone today’s swim. SW Winds of up to average 20mph coming in later this morning, gusting up to 27mph which equates to Force 6. Safety of swimmers is our paramount responsibility and it would be too risky, in the our considered opinion. 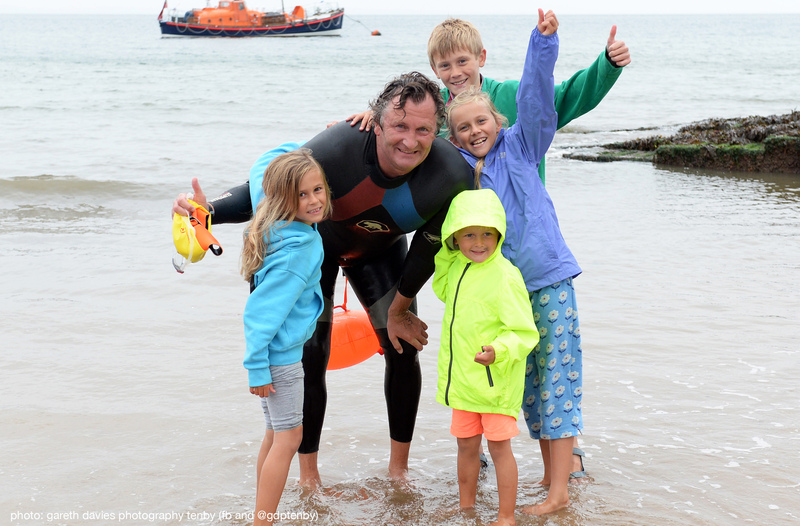 Replacement date is in two weeks’ time, Sunday 20th August, with the swim starting from Caldey at 11am. So all timings half an hour earlier – we have adjusted them in the event timings elsewhere on this site . Please contact the organisers if you are unable to participate on the new date. Sunday 6th August it is! 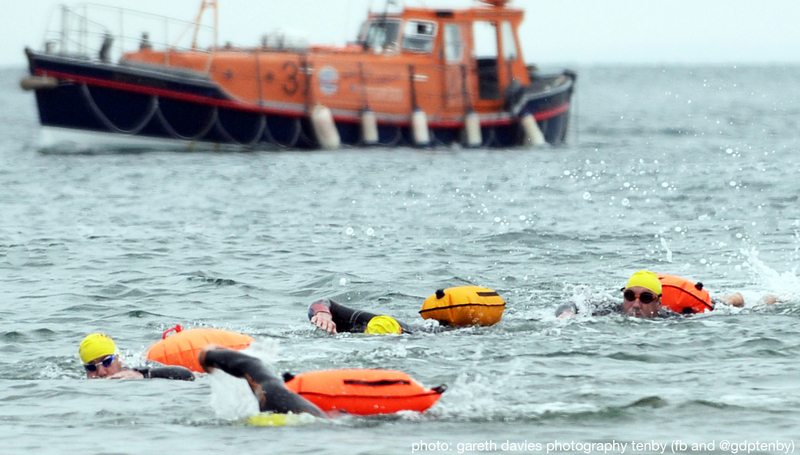 The swim will start at 11.30 from Priory Beach, Caldey, so swimmers’ boats will leave at 10.30. Registration on the day from 09.15. 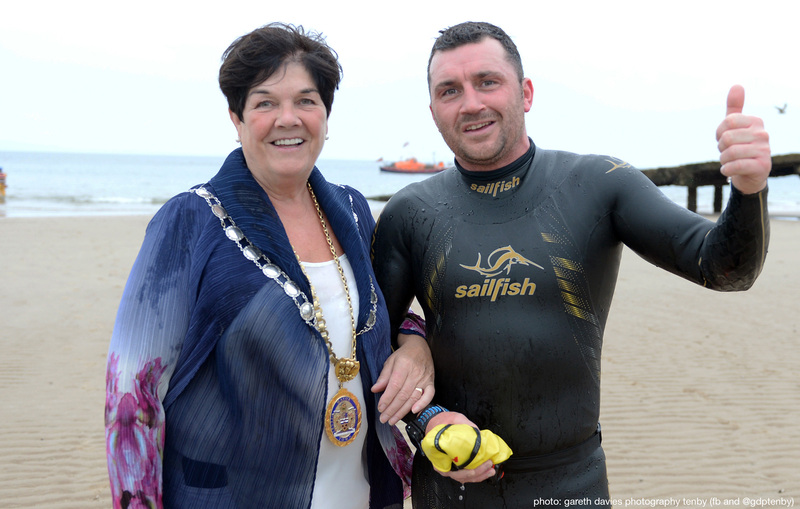 Online entry applications NOW available here: www.Tenby-Caldey-Swim.co.uk/SWIMMERS.